Today we’re joined with co-GM team Cernig and Langy to talk to them about their exquisite GURPS game “Edgerunners“. Not only is the game itself is phenomenal, interesting, and in-depth but the wiki is gorgeous beyond belief. These guys play over skype on a regular basis, yet another remote Campaign gets time in the spotlight as we explore October’s Campaign of the Month! First off, feel free to tell us about the people behind the GM screen. What do you do both aside from gaming? Alter Ego’s? Wives and kids? Let us know if you feel so inclined! Langy: I’m a teacher and a student; most of the time I don’t spend on Edgerunners I’m working on earning my Masters of Science in Statistical Computing degree or working at a private tutoring company teaching kids anything from how to read to college-level calculus. Unlike Cernig, I’m single and thankfully without children, at least at this stage of my life. With the time crunch of work and my studies, I don’t have much free time, but when I can I take time out to relax my brain with some TV or video games or, even better, a good book. Gotta give those brain-muscles a nice, deep tissue massage every once in a while or things just start to go funky, and not in the nice ’70s disco way. Cernig: I’m old – well, late 40’s – and married with a “hers, mine and ours” family of five. I worked in insurance for many years but nowadays I’m a stay at home dad and home-schooler for our eight year old autistic son. That gives me a fair bit of time to write, thankfully, and I am the Editor of The Agonist, a fairly well known political community blog, as well as having written foreign policy analysis pieces for other sites around the web. Tell us about Edgerunners in a nutshell. How did it come to be? Cernig: Well, we were both involved in playing my campaign The Town, which is also on OP, and as it got close to finishing we started talking about what to do next. I’d always loved the cyberpunk genre and Langy wanted to give it a go – from a bunch of discussions, the setting took shape. Langy: Well, from what I can remember (and this is pretty shady memory here), one of us – I think Cernig – mentioned the idea of putting together a cyberpunk campaign way back when. I had been working on a cyberpunk-ish setting for a potential book series that I’d probably never get around to writing, and when Cernig mentioned the idea of putting together a cyberpunk wiki, I jumped aboard – I had a few ideas I wanted to port over into it, and Cernig was interested in kinda redoing Cyberpunk 2020 into something that could be somewhat-believable given the current timeline. Anyways, long story short, we were playing in The Town, someone mentioned cyberpunk, we both thought it was cool, and BAM! Edgerunners was born. Cernig: We both agreed we wanted a slightly cinematic but gritty feel to everything, and to update cyberpunk for the modern day. The basic idea of the setting owes something to the author Charles Stross, who noted that a lot of transhumanism gaming and fiction seems like old video game backgrounds – there’s no dirt in the corners. We wanted to include the dirt. Langy: Yep. So we got together, talked about the kinds of dystopia that could reasonably come about from worst-case-scenarios going on from today – including reading up on some actual studies on Bad Things Happening like climate change – and came up with the basic premise of the Edgerunners setting. Cernig: We play weekly, and play by Skype text chat because the players are scattered across the country. Using text is interesting – you get less Out Of Character chat and more role-playing than sitting around a table – but a combat can take most of a session to resolve. Langy: I’m used to playing via text now; voice chat can be difficult to understand (especially if you have a horrible accent, like I’m sure Cernig the expatriate does), and playing in-person can be just plain impossible to arrange – especially when the people you want to play with are hundreds or thousands of miles away from you. Me, Cernig, and two of our players have been gaming this way for over a year now – first on Cernig’s ‘The Town’ game, then Edgerunners – and it’s as comfy as home. Also: If someone else isn’t wearing pants, I don’t have to see it, which is always a plus. I see you guys are using GURPS 4e, which seems like a great system for homebrew settings and stuff. Aside from GURPS, do you play/run any other systems often? Langy: I used to run Mutants and Masterminds 2e games relatively often, and way, way back when I GMed some D&D 3e and even AD&D 2e games, but in the past several years I’ve decided very solidly to stick with GURPS and GURPS only. It isn’t a perfect system, but it fits almost every desire I have for a system – adaptability, engaging combat that I can follow in my mind like an action movie, no class system, etc. It’s also got great support, and the system is based on actual reality, rather than pure wargaming abstraction. When you describe an action or an item in GURPS, you can point to an example from reality and say ‘that’s what it is’ and vice versa – point to anything in reality, and you can probably find some way to describe it in GURPS. It makes a game much more cinematic than some other game systems. Cernig: I started gaming way back in 1982 as a student at college, and played D&D then. I’ve played and GMed D&D, Star Frontiers, Call of Cthulhu, Cyberpunk2020 and old-style World Of Darkness over the years but nowadays, like Langy, I’m strictly a GURPS player. It’s just such a flexible system – I can adapt any setting to the rules, instead of having to learn new rules for every setting. How long have you known your co-GM and your players? How long has your group been together? How long has the campaign been going on? Cernig: Well, as we mentioned earlier, four of us have been gaming together a while now. The Town campaign ran a year. We’ve all found it really easy to form a gaming bond with the current Edgerunners roster, too – they’re all great people and great role-players. Edgerunners itself was almost six months in design before we kicked off the sessions, and we’re now well into our second “mission” so we’ve been playing in this setting nearly three months now. Langy: I don’t really see much to add to what Cernig said – Cernig knew some of the others a bit longer than me, but we got together for The Town when it started in summer of last year. We’ve got a core group from there, and others have dropped or joined, especially when The Town ended and we started up Edgerunners. One of our group, Garrion, is going to be leaving us after our next session – he got a new job whose schedule conflicts with ours. He’s been a good player – they all have – and we’re going to miss him, but we’re happy that he’s got this new opportunity stretched out before him. We hope to mark his passage from our game with a bit of a bang, give him a proper send-off – so hopefully that log’ll be a good one. Cernig: I discovered OP through a friend’s campaign – an OWOD setting called New York By Night. I liked the set-up so much I started transferring my existing campaign materials onto OP right away, and then when The Town and Edgerunners came along they were on OP from first principles. I’ve been a member over a year, I know, and must be coming up on Year Two soonish. Langy: Cernig brought me! I’d been swimming around the ‘net for years when I caught the scent of a game looking for players. Like a shark to chum (or perhaps a bass to a lure), I pounced – especially when I saw what an interesting setting Cernig had set up, all nicely detailed on this lovely wiki my computer-machine was showing me. I grabbed hold of Obsidian Portal that day and I haven’t let go since. Hopefully it won’t be reeling me in for dinner, but some days I think it may already have. Who does all the custom CSS and design work on the campaign wiki? It is drop dead gorgeous by the way! Cernig: Oh, that’s all Langy and you’re right – it is gorgeous work. I’m envious and in awe of his coding ability and design eye. One of these days I’m going to scoop out his brain, puree it, and see if I can’t build the result into a cyberware mod I can install! Langy: Our players are great! They’ve all happily worked on the wiki – especially posting Interludes of their characters actions between sessions, something we don’t require but definitely encourage and enjoy reading about. There hasn’t been as much creation of entirely new wiki articles detailing new aspects of the world, but there has been some and I’m sure there’ll be more in the future. As far as how OP helps – well, organization for one. A wiki is a great organizational tool, both for us and our players. Being able to put all the different characters, corporations, countries, types of cyberware and equipment all in one place, with nice logical links between them, allows for very quick referencing of anything we need during or out of play. It also provides us a nice foundation to lay our mark upon in order to create an attractive page design (relatively) easily with much, much less coding work on the back-end than we’d need if we were self-hosting or on any number of other hosting services out there. Cernig: We couldn’t play Edgerunners without Obsidian Portal. Being scattered across the countryside as we are, the ability to share a wiki of information has to be there – and we can’t just pass handouts around the table. I do love the ability to share GM-only information. Since Langy and I both GM and play – one taking the GM seat for a mission while the other plays, then trading off for the next mission – those hidden facts are essential for making sure we don’t tread on each other’s toes. What and where do you draw your inspiration from when dreaming up and running the Edgerunner campaign? I must admit that Night City really intrigued me, I kind of wish I was playing in your game! Langy: Dystopian fiction, 80s cyberpunk fiction, scientific studies of real-life worst-case scenarios, the old Cyberpunk2020 game, and the deep, dark recesses of our own cruel minds. Especially Cernig’s, though his ‘dark recesses’ are more like ‘grand canyons’. Cernig: As Langy said earlier, at least some of the inspiration comes from the old CP2020 game setting. Night City is a name they coined and although our City isn’t at all identical, it’s that one’s offspring. We get our inspiration from a lot of different sources. We both follow the news on new technology and science and then try to extrapolate that to the era of the setting, and we’ll often have chats where we both try to hang adventure hooks on something the other has written, or form a gestalt from our ideas. And yeah, I try to be pretty bleak about the future when writing for Edgerunners. Cyberpunk is meant to be dystopian and the trouble with transhumanism is it’s too shiny-clean for words. I’m sure the real future won’t be as bad as edgerunners makes it out, but I’m pretty sure it won’t be all gleaming white either. By the way – we did mention we’re about to have a vacancy. By all means make a character pitch! What would you say the single biggest highlight from Edgerunners has been so far? Cernig: Chasing across Night City in the early dawn in a 200 mile an hour flying car, while shooting at another one with non-lethal ammunition in the hope of bringing it down without making it crash-n-burn. Pure cyberpunk fast-paced action. I was GM-ing and even I was on the edge of my seat! Langy: Entering a church for the Amon Zero cult – a cult one of our PCs belongs to – with the whole group talking about their personal beliefs and philosophies and how they relate to the cult’s. And then when we get inside, one of the group just looks around and says, ‘shucks, nothing to easily steal and fence’ – right in front of the guy who is a member of this cult. Any time you can get your players to talk philosophy at the gaming table – and enjoy it – is a major win. Role-playing gold. Looks like you’ve still got quite a few links to start fleshing out on your main wiki page, do you have plans for all of those already or will they be conjured up as you move along? Langy: We’ve got plans for some. Others are there essentially as placeholders and to set down the link hierarchy. I’m not sure what we’re going to write about India, but we know that it’s an important player on the global stage. Cernig may have specific plans for a few of them, but I would be surprised if what goes into those missing Setting articles doesn’t evolve as we move forwards. The non-setting articles that need fleshing out we definitely have plans for, but we’ll need to do some work writing up and formatting all the crunchy goodness. Cernig: They’ll evolve, but I’d say we have those Setting pages planned, at least in general outline. When we were setting up the wiki we knew how we wanted the setting to fill out. It’s just that once we started playing the needs of the next session eat up writing time. Now that I’m not GM for a few weeks, I intend to flesh most of those out pretty quickly – maybe four or five pages a week. I see that each adventure log outlines the MVP and absentee players, can you tell us a little about that? (If it happens to be a GURPS thing then now you know how much I know about GURPS, if that’s not the case then how do players react to being the MVP? Does it spawn debates about ‘favoritism’ or competition?) Also, what do you do when players are absent? I only ask because every GM handles it differently, and knowing different ways to handle stuff like this helps us all!. Cernig and Langy: It’s not a GURPS thing – it’s something we evolved to encourage and reward players, like giving extra experience for writing logs or wiki pages. MVP is something that Cernig started with his The Town game, and we found it worked pretty well. The players themselves get to vote for the MVP – the GM gets no say, except to resolve ties. I’d say it gives us competition, rather than favoritism – it’s all about encouraging role-playing, and the players all seem to be keen on it. When players are absent – which hasn’t happened very much so far in Edgerunners, though it did a bit more in The Town – we typically play through, unless we don’t have a quorum. Our old quorum was at least two players and the GM when we were playing The Town, but since we’ve expanded to a larger group of players with Edgerunners, we’ll probably have a quorum be at least three players and the GM. We’ve found we have enough character depth in the way of side-stories, by-plays and hanging plot threads that it’s pretty easy to say an absent player’s character has been off doing something useful. The GM can also grab hold of that absent PC and have them do a few things if need be, especially if we ended on a cliffhanger last session. The GM typically does just enough to get the PC out of the way and off doing something – hopefully useful, but not very in-your-face/taking-over-the-narrative. That way no-one feels they’ve missed out on being involved, especially since absences aren’t the fault of the player, usually, but real-life breaking in. Cernig: Let your players play. What I mean is, they’re the real storytellers in the game – the GM is there as a facilitator – so never railroad them down your preferred plotline. There’s a Murphy’s Law of gaming somewhere, I think, that there’ll be at least one way of doing things you never thought of for each player in your group. Glory in that, let it take the story where you didn’t expect. Langy: When in doubt, when your players seem unfocused and not sure what to do – have a man walk into the room with a gun in his hand. Or, in Edgerunners, have his hand be a gun. Don’t be afraid to improvise like your life depends on it; one thing that’s been said multiple times over the course of this campaign is that ‘no plan survives contact with an Edgerunner team’, and that could be generalized to any PC team. You might have created the perfect plan for your group to follow – but the moment they stop following your plan, don’t just try and railroad them back on track. Instead, make something up – hopefully something equally interesting, but just do something to retain your players interest and never leave them thinking ‘this stroll down the street is taking way too much time and not much is happening’. That’s it for October everyone, have a great month and a happy Halloween. We’ll see you all back here next month to see who takes the crown for November! Excellent interview. I loved reading the whole thing. I also think this is the first CotM Interview I have seen with pictures, which is a nice touch. 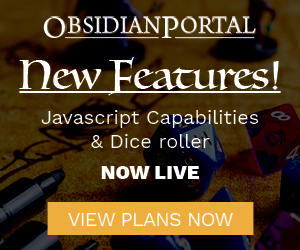 The co-GM thing came across really well and it has been really good to get to know a little bit about the personalities behind one of the most brilliantly designed campaigns on Obsidian Portal! Thanks, Twigs, for all your kind words and support! Thanks Twigs, I’ll be sure to put some more images in the CotM posts from now on too! Thanks for the comment, Twigs. Me and Cernig are highly pleased to be selected for CotM, and we really enjoy sharing our game with all of you. Let’s hope it continues to go so well! Congrats to those that Run on the Edge! You guys have really moved the bar! I second Twiggy’s comment about adding the pics from the campaign- it really does bring out more of the site! Congratulations and what a great interview! I agree in that the embedded images added to it. Well done by all!